Lake Tahoe is most well known for being a top ski destination, and hence for having cold, snowy weather, though the area around the lake itself, at 6,220 feet elevation, is relatively mild even in winter, with average daytime temperatures still in the 40s. Despite this, the lakeside still accumulates around 125 inches of snow each year, yet all main roads remain open. The ski areas are up to several thousand feet higher, enough to ensure below freezing daytime temperatures and as much as 500 inches of snow annually, which enables the resorts to stay open typically from November to April. Lake Tahoe has 14 major ski resorts, with ski runs as high as 10,000 feet. 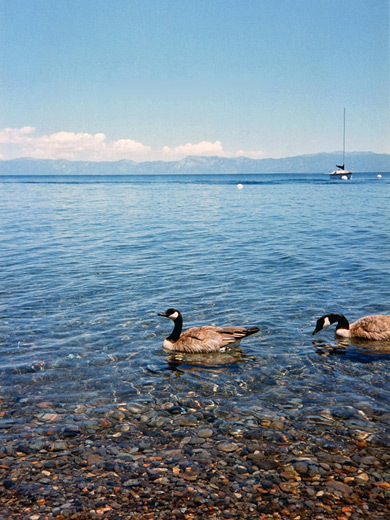 On average, 250 to 300 days a year are sunny at Lake Tahoe, with the percentage rising to 93% in summer, and humidity is very low, again especially in summer, when the temperatures are warm or even hot, averaging in the 70s for the four midsummer months, and with occasional highs in the 90s. Because of the high elevation and the purity of the air, ultraviolet levels are high so care must be taken to prevent sunburn, particularly on the ski slopes in winter when reflections from the snow can double the intensity. Lake Tahoe has never reached the magic 100°F mark, its record high being 99°F set on July 22nd, 1988. The temperature of Lake Tahoe varies from 68°F in summer to 32°F in winter, though the water never freezes, since the lake is very deep, has currents that continually rotate water from shallow to deep, and often experiences strong winds that keep the surface in motion. But occasionally some shallow, sheltered areas do freeze such as Emerald Bay, and the lake is generally too cold for swimming at any time of year.